I believe we have officially entered Almost Spring Limbo. You know, that time of year when you are inevitably dressed for yesterday’s snowstorm not today’s 57 and sunny, which you will dress for tomorrow only to find a lovely frost on the ground. I feel like I never get to enjoy the spring-like days because I decided fur-lined would be a good choice that morning. And thinking about the hot curry noodle bowls I was planning for dinner only makes things worse as I contemplate whether anyone on the subway would notice if I slipped off my boots. I didn’t in case you were wondering, but only because I couldn’t reach down to loosen them. I did however decide to try the noodles cold for dinner. Brilliant right!? I thought so. 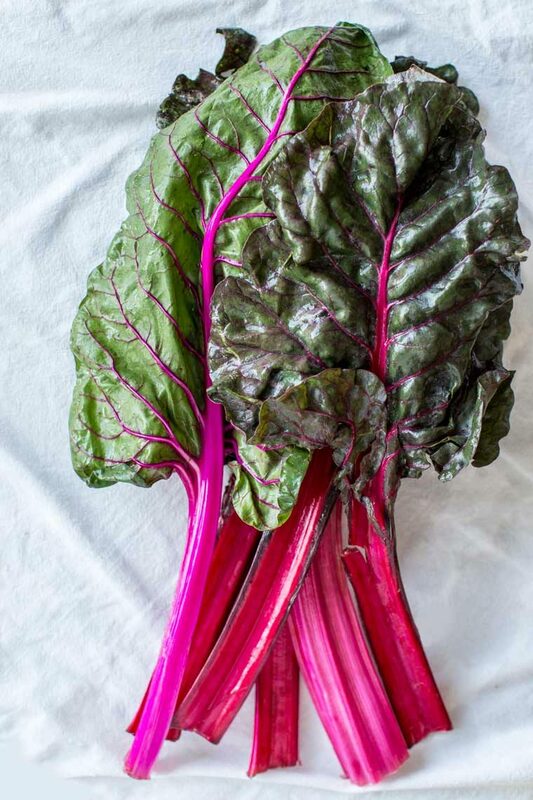 And as we move in to actual spring you can easily add different veggies to the mix – first on my list are spring onions. Or morels. Ooo or maybe artichokes. 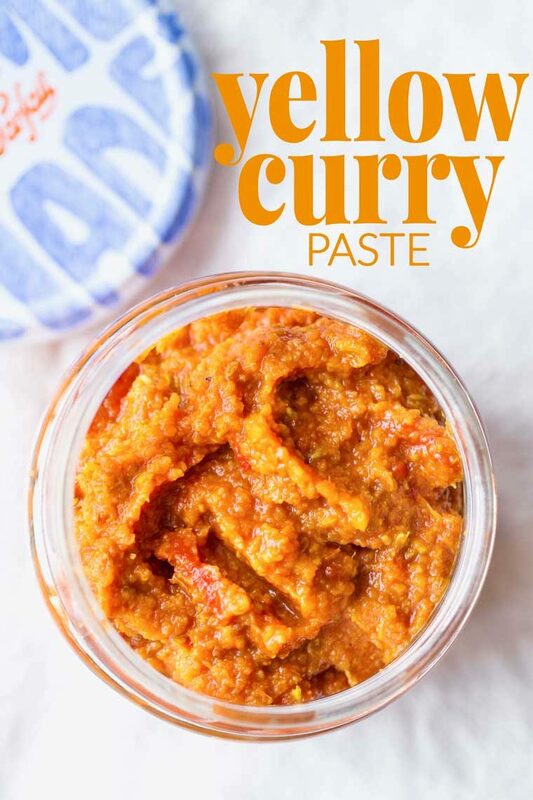 This yellow curry paste is the flavor base for the noodle bowl. 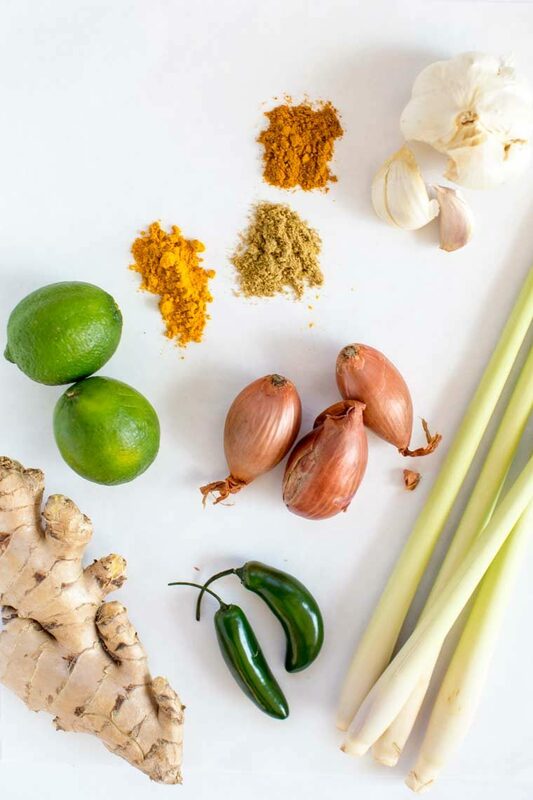 I was always intimidated by curries, all those ingredients and spices, I thought I had no business messing with until I realized that there is no master recipe for a curry, rules are more like guidelines, and its really all about flavor. The best part about this recipe is that you just throw everything in the food processor AAAND you can put all the scraps into a pot for what I like to call the “bonus broth”. Woah. Mind. Blown. You probably have all of the spices for this recipe already – speaking of which, I just KonMari’d my spice cabinet and have some tips on the subject. 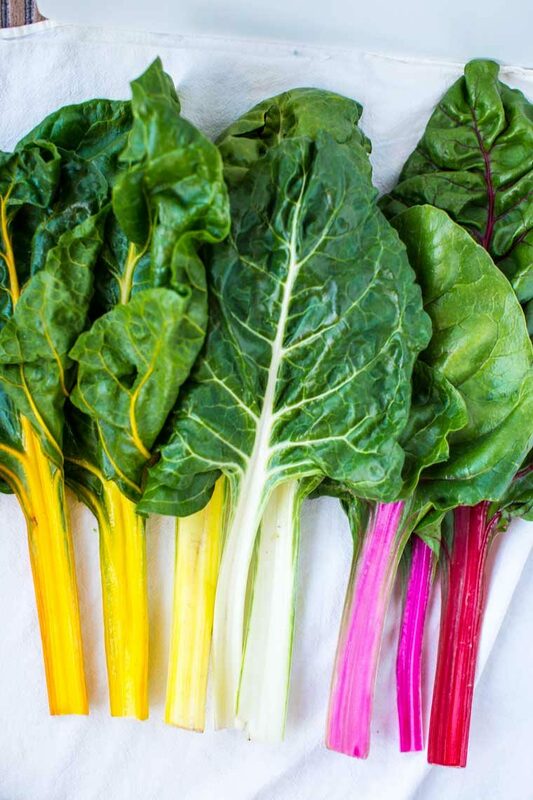 I used this swiss chard in the spicy salad to brighten things up – the stems in particular are perfect for this. Then use the leafy parts for one of these delicious recipes! First make the spicy cucumber salad: toss all of the ingredients together and let sit 20-30 minutes (if longer, put in the fridge but this is best eaten within 24 hours). Heat the oil in a large saute pan or pot (just something wider than it is tall). Add the curry paste and cook over med-low heat, stirring often until it caramelizes and darkens slightly, about 10 minutes. Add about 1 cup of the stock to the pan and scrape up all the browned bits stuck to the bottom. Stir in the coconut milk and follow the instructions below for whichever version you are making. Add the remaining 2 cups of stock and simmer for 15-20 minutes, stirring occasionally. Cook your noodles according to the package instructions and divide among four bowls. Ladle the hot coconut-curry broth over the noodles. Add the cucumber salad to the bowls or let people add themselves along with the garnishes. Bring to a simmer and cook, stirring occasionally for 20-30 minutes or until it has thickened enough to coat the back of a spoon. Cook your noodles according to the package instructions. Once cooked, coat the noodles in just enough oil to keep them from sticking together and divide among four bowls. Add the cucumber salad to the bowls or let people add themselves along with the garnishes. 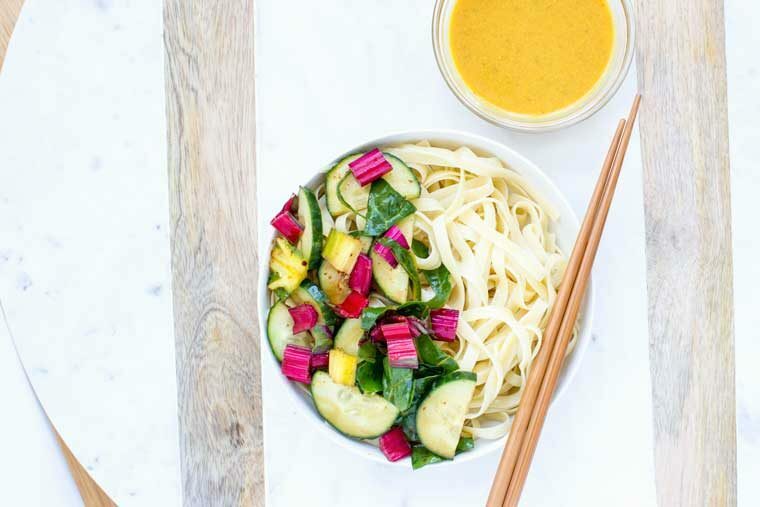 Divide the coconut-curry into 4 small dipping bowls and serve alongside the noodles. *I highly recommend making the bonus broth along with the curry (otherwise use veg stock or water). Use 1 cup if making the cold version and 3 cups is making the hot version. Toss all of the curry ingredients into a food processor and pulse until everything is broken down to roughly the same size. Scrape the sides of the bowl and puree until smooth. This will keep in the fridge for a week or in the freezer about 6 months. 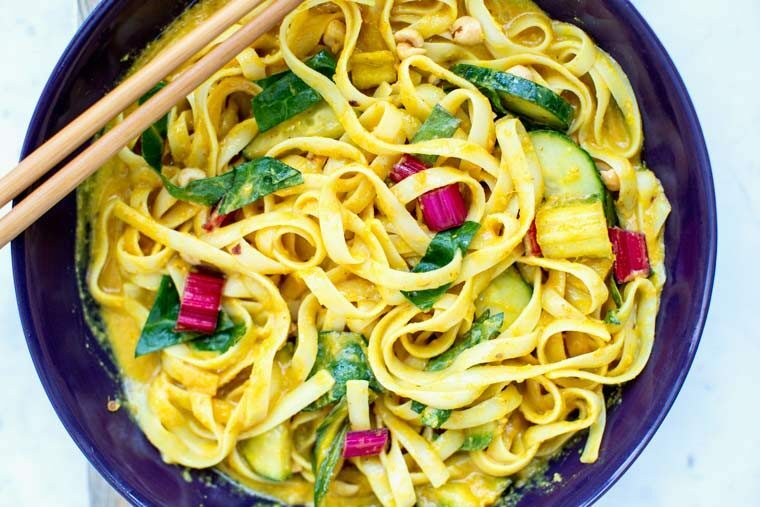 Love curry noodles and the idea of eating hot and cold – hot for dinner and cold for lunch the next day. Nom Nom Nom.